It is no suprise to us as educators that this is the case. We can see it every day. As I've discussed before, the problem is us! We are not offering curriculum that speaks to boys. Boys are very much interested in life and learning. They are curious and they wonder about how things work. School just isn't working for them. This adds further to my desire to see high schools dramatically changed. Secondary education is desperately in need of an overhaul - complete and total. The current model is not working. I imagine something more like elementary schools - interdisciplinary units that encompass the entire day. Give students more choice over what they study. (Why is it that elementary aged children are often given this freedome, but high schoolers aren't? Wouldn't it make more sense to allow them - as they grow in maturity and intelligence - more independence in their learning paths?) All of this woul dmake sense for boys AND girls. What's stopping us? Why do we hold onto this model? Perhaps change scares us - the educators. We are unwilling to let go of what has worked for us in our own education to consider what could be improved. Is anyone out there willing to engage in an extended thought experiment? Let's work on making a model of a high school that we feel would work in today's world. I'm very serious about this ... if you are interested, leave a comment or e-mail me privately. We could come up with a model and write an article. Someone has to start some change! Back from a much-needed vacation in Paris ... While there and reading on the Internet (what? you can't be enjoying Paris all the time! ), I found a list of useful sites. The author of this particular database has coined the term Office 2.0 (such as running your office using Web 2.0 apps). Hey - I'm coining a term ... Classroom 2.0! Anyway, some of those apps are useful for personal productivity, but I think many of them can be used by teachers. I'm dying to use the polling site and I've already introduced my students to Writely. I can imagine using a shared Google Calendar as a source of assignments and due dates. I found a great site right before vacation called CommunityWalk - a tool I can see being used especially by history teachers to map historical events, but it could also be used with literature, as well. I know Nancy does stuff with Flickr. Jumpcut looks like a great site for editing together images for a movie or slideshow. Blogs are very useful, of course, and LearnerBlogs is especially for students. There's a lot out there for Classroom 2.0 (I want 25 cents anytime anyone uses that term). What are some apps you, the readers, use? Things have been beyond hectic lately. I'll be happy when May arrives and my schedule slows down. What have I been doing lately (besides not posting on this blog)? My students are currently working on a unit about persuasion. This started really with watching Super Size Me. We started off talking about audience and purpose and now we've focussed on having the purpose of persuading (and how much all the other purposes - informing, entertaining, etc - are needed for persuading). Last week, students analyzed magazine advertisements and we constructed a list of techniques used by advertisers. They were then given a task. They were divided up into small groups to make companies. I pretended that I was a toothpaste inventor and I was looking to hire an advertising company to design the box and a TV advertisement for my toothpaste. They had to decide what my market audience would be, what made my toothpaste special, design the box (and be able to explain why their design will attract my market), and act out a TV advertisement (and be able to explain what persuasion techniques they used and why those would be persuasive to the audience). They did an excellent job. I told them that I wanted them to rehearse over and over again -- and they did! Some had jingles and dance steps that were hysterical. I was very proud of their work. Now we are moving on to a persuasive essay. I really don't want the standard persuasive essay on abortion or gay marriage. Lord knows they've probably done enough of those. This week (before Spring Break - yeah!) we are going to talk about selecting personally relevant topics. My criteria for a topic to be personally relevant is that the student is going to have to be able to talk about some personal experience he or she has had and use that as an example. After that is done, sometime in May, we will talk about how short stories and poems can be persuasive. 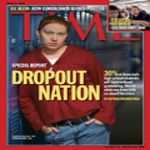 There's a cover article at TIME on the large high school drop out rate. It reports something that isn't exactly a surprise or all that shining - more and more students are not finishing high school How to fix this problem? More money and more tests are not the answer. More and more students are dropping out because high schools are becoming more and more obsolete in their practices. A majority of high schools are still large learning factories. They were designed during the Industrial Revolution - working off the success of assembly line manufacturing, school officals designed large schools to be assembly line learning. At the time, college was only for the wealthy elite. Most people didn't go to college so preparing a large majority of teenagers for college was wildly unnecessary. There's nothing wrong with high schools - they are doing exactly what they were designed to do. When the current system of educating adolescent was developed, many students did not complete it and many of those who did weren't going on in their education. What we really need is a complete and total restructing of how we look at high school. The current design needs to be thrown out the window and real innovations need to take place. Can we do this though? Can educators throw out everything we know about educating adolescents to completely redesign high schools. One thing I would completely throw out is the barriers between subject matters. Students go from class to class - math to Spanish to English to history to biology - never seeing how the world really works. In the world, those delineations are not clear. If I were completely restructuirng high schools in this country that would be at the top of my list. How would you completely restructure American high schools? Last week, my students read some poetry written by Tupac Shakur. We've been working heavily with audience and purpose in writing - trying to get into the head of the author of whatever we are reading. I decided to use Tupac's poetry on the fly because I knew they would be excited by it. I didn't know that they would be able to deeply analyze the poetry as well as they did. In their groups, they were using their background knowledge of Tupac's life to help them figure out what must have been going on in his head. They were unwittingly using literary elements to decifer meeting. In a poem that uses symbolism heavily they had talked about meaning on a level that I had not expected. This got me thinking about what conditions are necessary for students to be able to analyze literature. Surely, if I had given them another poem written by an unfamiliar poet they would not have been able to do the same kind of analysis. I know, because I've given them other types of poetry and I had to lead them through interpretation a lot more than I did with the Tupac poetry. My gut tells me that it wasn't simply that they knew something about Tupac. Having some factual knowledge about a poet's background can help, but not as much as I saw last week. They understood what he was talking about. They understood feeling like the world was against you. They understood that sadness and loneliness that he wrote about. They understood what he was writing on a deep and personal level. This makes me wonder. I know my ability to analyze literature has grown as I have gotten older. I used to think this was because my analysis skills had improved and I had practiced so much. What if my skills got better because I had more life experience under my belt? As we grow, we learn more about the world. We experience and understand emotions better. Remember back to when you were a teenager. You had a plethora of emotions, but didn't understand them. If you can't understand your own emotions, how then can you understand the emotions of someone else, especially when the emotions are hidden behind big vocabulary words and nefarious literary techniques? Those students who seem to be able to analyze literature the best are also those who seem to know more about the world. My students - and I'm sure this is true of many teenagers - live in a small bubble. It's all about them, their friends (and enemies), their school, and their family. Many of my students rarely go outside of Harlem unless they are on a school trip. So, is our job to teach analysis skills alone, or should we be trying to expand our students' knowledge about the world and life. Many would argue that literature does that, and I agree to some extent. But that is experience by proxy. It seems like first hand knowledge and experience would aid students' interpretation and analysis skills because they would understand the core emotional meaning. The only obstacle then would be the words. But, if they don't understand the emotion from first hand experience, there's a lot more obstacles than just the words. I'm not sure if I've come to any conclusion at the end of this post. I find it a very interesting question: Can our students analyze literature if they haven't experienced the emotion themselves? I'm not sure my answer to that question, but I'd like to hear others'.